„Conformable Electronics „the current Buzz word in dynamically shaped and stretchable structured 3-D electronics. With this new technology a wide range of industry sectors can be serviced, from medical technology, smart textiles, IoT, machine to machine process technology and avionic up to consumer electronics. With the introduction of elastical and stretchable PCBs as a sub-group of conformable electronics, completely new fields of application and solutions for electrical systems and assemblies are accessible. Typical products are intelligent bandages, smart textiles and wearable electronics (Wearables). Highly flexible, stretchable and adaptable electronic circuits are generated based on elastic materials that allow highly dynamic shaping, adaptable component assembly and encapsulation as well as lamination on textile materials followed by textile industrial processing. Opposite to the well-known flexible/rigid-flexible-technology and established Polyimide basis this material for this new product based on highly elastically thermoplastic Polyurethane (TPU)-Foil on which copper foils are laminated. The material used for the process is biodegradable and free of plasticizers. The PU is available in various modifications from hard or soft to elastically with products being used in many industries from matrasses, shoe soles, pipes and gaskets, as building material or as leather imitation for furniture to name just a few examples. In the application as stretchable PCB substrate a highly elastically foil based on multi-block co-polymer with hard and soft segments is being used. The currently used production standard thickness at CONTAG of the PU material is at 0,10mm, other thicknesses reaching from 0,05mm-1,00mm are possible upon request. At CONTAG the dielectric base material, the copper foil is laminated and structured which allows to select a final copper thickness from 5-70µm. The achieved adhesive strength or shearing value of the copper foil reaches 3N/mm and hence significantly higher as in the respective IPC Norm (>1N/mm). The applied electrical Layout in the form of copper structures influences significantly the mechanical properties of the final circuit. In particular, the elongation at rupture of a pure TPU material cannot be achieved in this case. Depending on the design of the stretchable area of the circuit board, it is possible to stretch once up to 50% and repeatedly up to 30% if the board is structured using meander or the so-called Horseshoe Design. Starting point for various build-up and realization options is a one or double sided copper-coated TPU foil which following the base processes of a normal PCB manufacturing like printing and etching processed further. Therefore, the parameter of the individual processes have to be adjusted to match the specific requirements of the material. Technological challenges arise due to the high thermal extension co-efficient and the mechanical condition of the material. Depending on the execution and the term of use different optional processes might follow, i.e. It is possible to realize singular, double sided or multi-layer and plated circuits based on structured TPU Layers whereby it is necessary to bear in mind that the stretchability reduces with an increasing thickness of the material layers. Combinations as rigid-stretchable layer similar as the well-known rigid-flex PCB are possible when the Polyimid is replaced by a TPU layer. Purely stretchable circuits might require partial strengthening in order to incorporate plugs of assembly areas. To meet these adjustmentsm, foils of Polyimid or Polyester and similarly FR4 can be used. It is possible to use most of the known chemical surface finishes for the final metallization like NIAu (ENIG), NIPalAu (ENEPIG), tin (ISn), silver (IAg), Silver/Gold (ISIG) or Pal/Au (EPIG), partially or full surface covering. 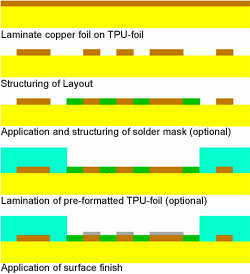 Surfaces with NI levels cannot be accommodated due to the brittleness of NI after the application of a structured solder stop/TPU-Coverlayer partially extracted. Radii, opening angles (opening angle o° = half circle) similar as line space. The max. possible and repeatable stretching is at approx.. 50% i.e. 30% Depending on the Layout. Due to the melting temperature of the TPU material starting at approx. 155°C a low melting solder on the basis of SnBi or SnBiAg alloy should be used. One option is the solder Indalloy 282 which operates at a melting point of approx. 140°C. The application of the brazing solder is realized via screen printing. Similarly conductive glueing and crimping are tested and approved connecting technologies. For the crimping of a plug contact it is important to note that crimping contacts need to be enhanced, for example with partially embedded Polyimid or FR4 sections. For the assembled units it is possible to use encapsulation for protection. For this purpose one component or hydrosoluble Polyurthane can be used which is applied as injection moulding or with a Glob-top pistol. Furthermore PU-rings (Dam&Fill Glob-top) and the placing of pre-cast PU-caps with connected thermal adhesion are proven connections. In the scope of apllication in Textile/Wearables it is advisable to laminate on cotton based materials before the assembly. CONTAG uses the hydraulic press on which the material is melting in connection with temperature and pressure and worked into the fabric structure. For permanently formed applications like operating consoles etc. it is possible to laminate the TPU circuit onto a relatively rigid carrier foil for example onto Polycarbonate (thickness 200-300µm) which after the assembly will be thermo formed. The use of thermoplastic, stretchable substrates allows completely new applications in the area of conformable and Wearable Electronics. On the basis of thermo plastic Polyurehtane materials it is possible to produce electrical circuits that can be permanently deformed, exposed to dynamic loads and stretched at the same time. The electrical layout is single sided in the standard version but can be manufactured as a double sided contacted circuit or alternatively in a rigid-stretchable version. In the stretchable areas meander layer of electrical circuits allow the the extension of the substrates that depending on the design and stack can be stretched up to 30%. CONTAG AG has gained extensive experience and knowledge in these innovative technologies backed up by its participation in various Research- and Industry projects and offers prototypes in Express manufarcturing times. For further questions regarding this technology or around the subject of stretchable PCB or thermoforming and Wearable Electronics please contact the CONTAG Team. (Tel. +49 30 351 788 – 0 or team@contag.de).